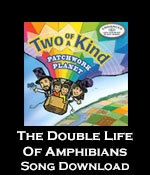 This song was commissioned by the Detroit Zoological Institute for their new amphibian facility - Amphibiville. We found a lot of fascinating information about amphibians in a book called “Tracking the Vanishing Frogs” by Kathryn Phillips (Penguin Books), and also from Andy Snider, Herpetology Curator at the Detroit Zoological Institute. Listen to a sample of instrumental this song.